Kawasaki Z1000 Forum: Kawasaki Z1000 Motorcycle Forums > Kawasaki Z800 Forums > Kawasaki Z800 General Discussion > Kawasaki Z800 Finally Coming to the States - Except California For 2016! Kawasaki Z800 Finally Coming to the States - Except California For 2016! Kawasaki announced it will import its Z800 middleweight streetfighter to the U.S. for the 2016 model year, slotting in below the Z1000 in the company’s lineup for $8,399. Unfortunately for residents of the Golden State, the Z800 will be a 49-state model and will not be available for sale in California. The Z800 is not a brand new model; it has been available in Europe since 2013 where it replaced the Z750, and is only now coming to the U.S. 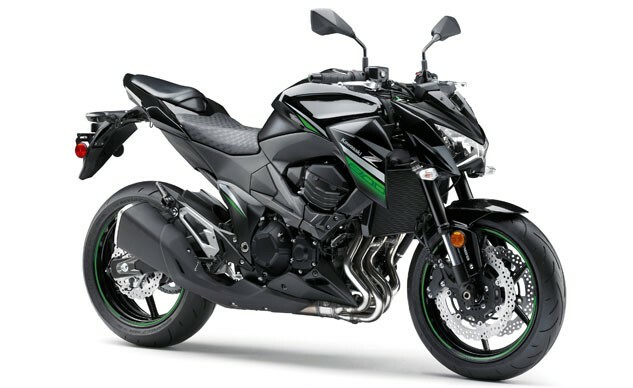 In this manner, the Z800 is similar to Suzuki‘s GSX-S750 which was also only available in Europe (under the name “GSR-750“) for years before finally coming to the U.S.
Powered by a 806cc four-cylinder 16-valve engine, the Z800 claims strong mid-range performance suitable for street use. Fuel is injected by 34mm Keihin throttle bodies with sub-throttles, promising a smooth response across the rev-range. The Z800 also uses two different length intake funnels to optimize airflow for different engine speeds. Equalizer tubes connect header pipes one with four and two with three to improve engine response at low-to-mid rpms. A six-speed transmission offers short overall gearing for strong acceleration while a tall sixth gear helps the Z800 maintain a comfortable engine speed for highway cruising. The engine is mounted in a high-tensile steel tubular backbone frame and cast aluminum engine subframe. The subframe connects with engine mounts located behind the cylinder, close to the engine’s center of gravity to reduce engine vibration, especially to the handlebars. Rubber mounts also help quell the vibrations and improving feedback. The front wheel is suspended by a 41mm KYB fork with adjustable rebound and preload, offering 4.7 inches of travel. At the rear, a KYB shock with a piggy-back reservoir offers adjustable rebound damping and spring preload and 5.4 inches of travel. Dual-opposed four-piston brake calipers stop the 277mm front discs while the 216mm rear rotor is paired to a single-piston caliper. The Z800 comes standard with a Nissin anti-lock brake system. The six-spoke wheels similar to those on the Z1000 come with Dunlop Sportmax D214 radial tires. Like the Z1000, the Z800 adopts a forward-leaning stance. A flat handlebar offers a wide grip position, providing more steering leverage while risers give the Z800 a more upright riding position. Other highlights include a 4.5-gallon fuel tank, digital display with three LCD screens, LED taillight, luggage hooks on the license plate holder and behind the passenger pegs and an electronic immobilizer. Kawasaki claims a curb weight of 509.4 pounds. Heavier than a z1000 with outdated brakes. I am having a hard time seeing how this is a 'middleweight'. Yoshimura Fender Eliminator. Arrow Single Thunder Full Exhaust. K&N Air Filter. Rhinomoto Bar Ends W/CRG Blindsight Mirrors. Kawasaki Tall Windscreen. Two Brothers Racing Juice Box. Stebel Intimidator Horn. Meetalgood Shorty Levers. Speigler Brake Lines with EBC HH+ Pads. Yoshimura Swingarm Spools. I'd love to, but I don't understand your problem, could you describe it more and provide a picture?